Shukuba-no-yu is the municipal hot spring public bathhouse made newly in Futai which was the post town of the Joetsu border. 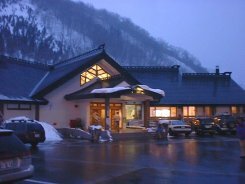 Since the Tashiro skiing area is immediately near, it is the best for your dropping in at return of skiing here. The building is new and the bathroom is the building of eight square shapes. Although a bathtab is not so large, there is a Jacuzzi. There is no open-air bath with regrettable. A washing place is large and has considered use of a skiing visitor well. Probably, using for hike return in summer is good. We came here after skiing in Yuzawa. Since the steam of a bathroom is deep, I cannot take a photograph well. Water of a hot spring is made a little hotter, and is well effective against the tiredness of skiing. Since especially the Jacuzzi had the wonderful massage effect to my thigh, I want to keep soaked there. The nature of the water of a hot spring is an alkaline high-temperature spring. The temperature of the fountainhead is 52.1 centi- digrees. The water is the touch been smooth. Although soap is in a bathroom, there is no shampoo. It divides into smoking and un-smoking, and a break room is large and is clean. Get down by Tsukiyono IC of the Kan-etsu expressway, and go in the direction of Niigata by the national highway line of No. 17. Cross the Mikuni peak. It is in the neighborhood of the bridge in front of the Tashiro skiing area. When you go by another route, get down by Echigoyuzawa IC and go a No. 17 line in the direction of Tsukiyono from the Yuzawa-cho. It is in the place which escaped from the Futai tunnel.